LAST week we were able to give a brief description of the newly-launched Vickers-Saunders flying boat "Valentia." We have now received a photograph showing ДальшеMore>>> this machine on the sea, and also a brief specification of the machine. The general layout will be seen from the photograph. 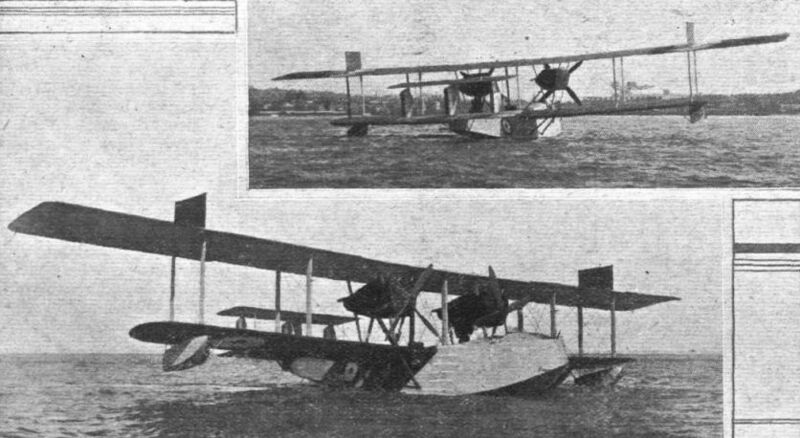 Generally speaking, the "Valentia" is of orthodox design, showing the typical Vickers biplane tail and rudders, but with an overhanging top plane, braced by overhead wires running to rectangular king-post frames covered with fabric to provide fin area above the plane to balance that of the boat hull. The latter is flat-sided, with a Vee bottom and, of course, steps. Chord 10 ft. 6 in. Incidence of main planes 5 degs. Dihedral of main planes 1 1/2 degs. Area of main planes 2,000 sq. ft. Weight per square foot 9.15 lbs. Weight per h.p. (2 X 600) 15.25 lbs. Time to 6,000 ft., all up and full throttle, 9.5 mins. Speed, 110 m.p.h. Time to 10,000 ft., all up and full throttle, 19.25 mins. Speed, 106 m.p.h. Endurance, 8 hours at 98 m.p.h. THE VICKERS-SAUNDERS "VALENTIA" FLYING BOAT: The engines are 600 h.p. Rolls-Royce "Condors," mounted on pairs of Vees between the wings. THE VICKERS VALENTIA FLYING BOAT: Designed by Vickers and built by S. E. Saunders of Cowes, this machine is fitted with two Rolls-Royce "Condor" engines of 650 h.p. each. Successful flying tests have been carried out recently at Cowes.